The Mongolian government has agreed to pilot a medicines traceability system based on blockchain aimed at eliminating falsified medicines in the country. It’s unusually broad in scope, covering all medicines distributed in the country rather than selected products from a few companies as is often the case for pilot studies. The blockchain technology underpinning the track-and-trace system will be delivered by FarmaTrust, a UK company that aims to use blockchain, artificial intelligence and data analytics to make a provenance system that makes pharmaceutical supply chains more secure as well as more efficient. The platform relies on integrated, transparent links between manufacturers, warehousing, shippers and logistics companies, and hospitals/pharmacies, with medicines authenticated by the ultimate customer using a smartphone app. In theory, it should allow supply chain partners and the authorities to know who had which drug, at which point, both physically and in time. 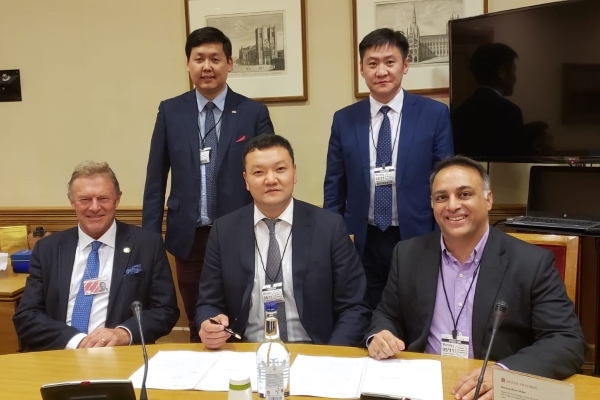 Mongolia’s government drew up a memorandum of understanding with FarmaTrust for the project earlier this year, and the pilot study agreement was signed at the House of Lords in London this week. The implementation process is due to get started in the middle of 2019. The UK company’s CEO Raja Sharif (pictured bottom right) notes that this will allow FarmaTrust to advance its concept to a live implementation for the first time. It will also be the first ever implementation at scale of a blockchain-based track and trace solution within the pharma industry, as well as in this particular territory, that does not already possess an existing technical infrastructure. “The project will display FarmaTrust’s ability not only as a primary blockchain company, but an entity that can work on a consultancy basis at country level,” said Sharif. In time, the intention is to use the platform for other purposes alongside tracking of medicines, including automated payments, auditing, and regulatory reporting. The project gets underway as Mongolia is starting to transition to a Western-style pharmaceutical market from the current government-controlled system which is focused vey much around in-patient care in hospitals, with plans to double healthcare spending over the next few years. The country’s 3m population relies heavily on imported drugs, which account for 80 per cent of the overall market, according to US government estimates. Imports were valued at around $160m in 2016. Recent sampling studies have suggested however that substandard drugs – which could be either counterfeit, unregistered or legitimate products that have failed quality standards because of production or storage problems or are beyond their recommended shelf life – account for around 18 per cent of all medicines and upwards of 40 per cent in rural areas.